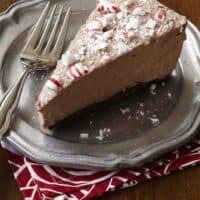 Rich, decadent Chocolate Peppermint Mousse Pie. This is the holiday dessert you were waiting to indulge in! You guys are going to LOVE this recipe. Remember a couple weeks ago I shared these Peppermint Cream Bites? Well, thank you all for voting, because I made it to the final round! I had the opportunity last week to go to the Better Homes and Gardens test kitchens and to create my own, original recipe. Nope. Not nerve wracking at all. I’m used to having cameras and video recorders on me at all times. Getting my hair and makeup done professionally, no biggie. And working in their kitchen, being interviewed, not stressful at all. In all seriousness, I had a fantastic time. The team at BHG was so sweet and kind, and of course hanging out with some of my favorite bloggers was the highlight of my trip! So today’s recipe is what I made in their kitchen. The crust is made with hazelnuts, chocolate, butter and sugar, then baked! It’s then topped with a light (yet incredibly rich) homemade chocolate, hazelnut, and peppermint mousse. A little dusting of powdered sugar and crushed candy canes give it a festive touch! Want the recipe? (please say yes!!) Head on over to BHG! And while you’re there, please vote one last time. It doesn’t have to be for my pie (although I appreciate any votes I receive)….just vote for your favorite holiday dessert, deal? Grease a 9-inch springform pan with 1 tablespoon butter; set aside. In a food processor, pulse hazelnuts with granulated sugar until finely ground. Add flour, cocoa powder, softened butter, and salt. Continue to pulse until well blended. Press into bottom of pan. (Mixture may be crumbly; use hands to press into pan in an even layer.) Poke with fork. Bake in a 375 degree oven for 18 to 20 minutes. Cool completely. In a small saucepan, add cold water to pan. Sprinkle with gelatin and allow to bloom (absorb water) for 2 minutes. Heat saucepan on low and whisk gelatin water for several minutes until completely absorbed and dissolved. Remove from heat. In mixing bowl, beat chocolate hazelnut spread, cream cheese, and peppermint extract. Add gelatin to cream cheese mixture. Beat on medium high for 2 to 3 minutes, scraping down sides of bowl as necessary. Set aside. In a cold mixing bowl, beat heavy cream with sugar until soft peaks form. Fold in cream cheese mixture. Pour over cooled crust and refrigerate for 3 hours or overnight. To remove springform pan, use plastic knife and run along edges. Remove sides of pan. When ready to serve, sprinkle with powdered sugar and crushed candy canes. 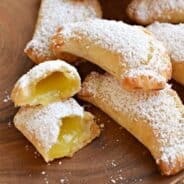 I have tried everything and I cannot find the actual recipe ! I have been receiving your emails for quite a while now, and I love so many of them. I haven’t actually made any of them, but they look so great, I will definitely try them at some point. I wanted to get this recipe, so I clicked on the link to the BHG website, but I couldn’t find the recipe. If you could please let me know where I need to go to be able to print it off, I would greatly appreciate it. Thanks. I have also searched the site for the recipe as I would love to make it for a special ladies Christmas party on Wed. Unable to find it. Please let us all know where or how to find it. 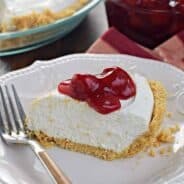 I have also searched for the recipe and can’t find it anywhere. I would also love to make it. Please let us know where it is posted. Thanks! 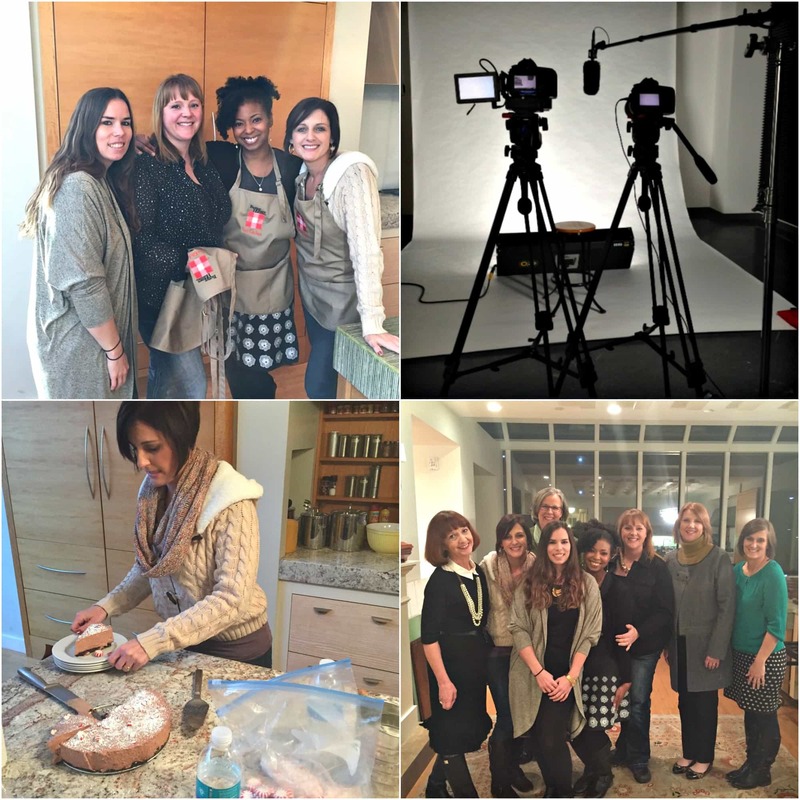 Can’t believe you were at the BHG test kitchens – how fun!! And with those great ladies, I bet you all had a blast 🙂 I love the plate you used for this pie, too! Pinned! Their prop room is out of this world! I would have liked to keep a few of them 🙂 Thanks for pinning!! I can surely attest to the greatness of this pie! The filling is to die for! I had so much fun Aimee! See you soon I hope! This is so exciting Aimee! I love seeing the pictures from BHG – I’m going to vote! Its amazing Aimee. So beautiful and SO DELICIOUS (I know, I ate more than anyone) and so perfect. You are such a talented and creative dessert maker!! What an awesome experience!!! And that pie? OMG. It looks sooo good. This pie sounds so good, perfect for Christmas Eve! Congrats, Aimee! That’s so awesome! Look at you, all famous and amazing 🙂 No surprise there! What an amazing experience! Off to vote for this gorgeous pie! I am just so grateful that I got to spend more time with you. I thought you were awesome before but now I am pretty much obsessed with you! Sorry but it’s true. Love you doll! And I can’t wait to make this pie, without the nuts lol. This looks amazing and I bet it was so cool getting to go on this trip! I voted! It sounds like you had an amazing time – what a well deserved honor! 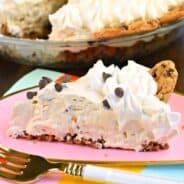 This pie looks absolutely divine! Woo hoo! That looked like such a fun couple of days! Of course I will vote for this amazing looking dessert!!! I followed link and voted for you as well. Looks delish. 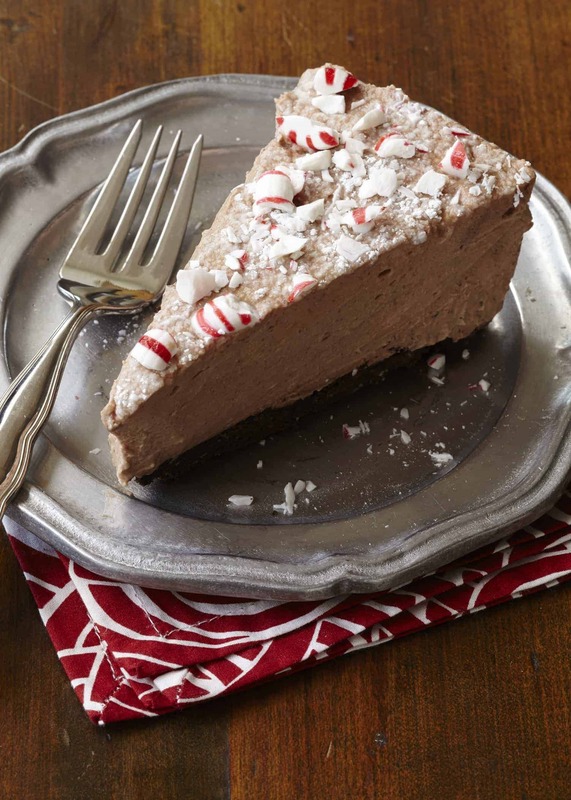 I do have a question on BHG the step on adding the peppermint extract is missing. When and where is it added, thanks! haha! Good catch. You add the extract to the chocolate hazelnut and cream cheese mixture. Beat it in with those ingredients 🙂 Thanks for the vote! How could anyone NOT vote for your pie??! It looks so silky and light and beautiful and festive!!! Yum! That looks decadent and delicious. 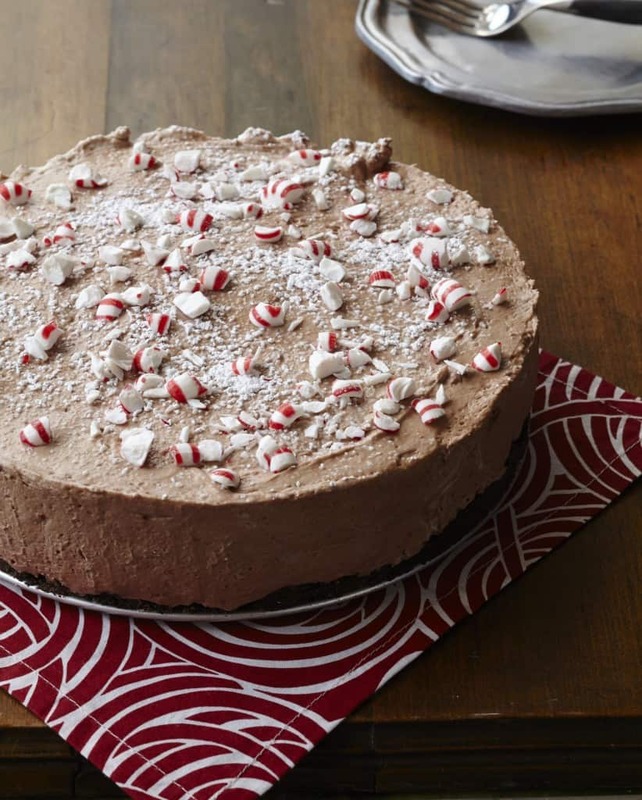 I love chocolate and peppermint – so festive. Thanks for sharing! This looks so light and fluffy yet completely decadent. In other words, I need a slice…or 10. Not at all nerve-wracking 😉 It looks like you hit it out of the park with this fluffy pie. Love! Pinned. Headed over to get the recipe.